After enjoying the modern day Mahabharata two weeks ago, its time for modern day Ramayana and the person who is directing this modern day epic is none other than the Master story-teller Mani Ratnam. Does the ace director show who the real guru is? Well, he almost has. The story-line is simple, Beera (read Raavan)abducts Ragini (read Sita) wife of Superintendent of Police Dev (read Ram), to avenge the death of his sister Serena (read Shurpanaka). But Beera instead of killing Ragini falls in love with her. The dense forest looks a mission impossible for Dev if not for an over enthusiastic and bubbly forest officer Sanjeevani (read Hanuman). And while Beera is getting attracted to Ragini more and more Dev is getting closer to Beera. Ragini's love for Dev never changes but she also feels sorry for Beera. Will Dev be able to rescue Ragini? Will Raavan avenge the death of his sister? Well, you do know the story don't you? Or do you want to guess? Taking the story-line from the mythology is not new for Mani and he has come up with quite a beautiful way of presenting it. But where he falters is in the pacing of the script. Can the movie be any different if it was not a non-linear screenplay? Will it be any different if the climax was compelling (not that it was bad), if Mani hasn't taken so many logical liberties? Well, it could have surely made the experience better. The movie starts off fine but the pace drops considerably and until interval the movie goes in a more sluggish manner. Added to that the unnecessary slow motions. The second half picks up pace but the climax might get mixed reactions from the audience. The reason for that is, we don’t know who is right and who is wrong. Is Dev the bad guy? Yes, according to the movie he might have been, but morally he is right. there are several brilliant scenes in the movie which does make a trip to the theatres necessary. Abhishek Bachchan as Beera was good but not great, he lacked the toughness he showed in Yuva. But overall he did manage to carry the movie forward in his able shoulders and his hard work for the role did show. Aishwarya Rai as Ragini was looking gorgeous and acts like a pro. It’s a shame that only a few directors are able to get the actor out of her. 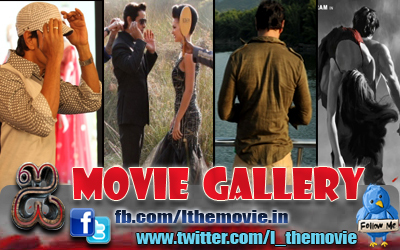 Vikram as Dev, looks a tad overweight but as always reliable with his emoting. Govinda as Sanjeevani is good but if only he had smarter and wittier one-liners, the effect would have quadrupled. Priyamani was sensational in a cameo. Nikhil Dwivedi is competent enough for the role of Dev's side-kick (supposedly Lakshman). Ravi Kissan is a revelation as Beera's brother. 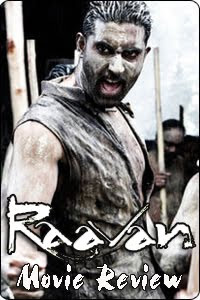 Technically Raavan stands out; every frame in the movie is picture perfect. Manikandan and Santosh Sivan have out done themselves. The camera goes in the most unlikely places to make the experience spellbinding. Editing by Sreekar Prasad is good but could have worked more in the first half. Music & Background by Rahman is a treat. Its awesomeness taking the form of chords. Action sequence choreographed by Shyam Kaushal and Peter Hein is mind-blowing but just because they are in the crew sending almost all the characters off the cliff is a little bit over done. Dialogues are well written but nothing sensational about it to quote. Overall, Raavan is a visual spectacle, a modern day Broadway musical of Ramayana which might get mixed reviews from the audience but take this in, it’s in no means a bad movie. We expect greatness from Mani Ratnam, and maybe the expectation is at fault. But don't miss this in the theatres, for its visual poetry by Santosh Sivan and Manikandan.